Even though they lived some 65 million years ago, dinosaurs and other prehistoric reptiles continue to rule today. From movies to comics and cartoons, these ancient, giant beasts are everywhere you turn. Of course, who wants to just read about or watch these dinos when you can learn how to use pencils, pens, markers, and more to draw your very own? Cartoonist James Silvani combines easy-to-follow art exercises with the latest, greatest dino-facts to help you create fun and cool dinosaur doodles all by yourself. 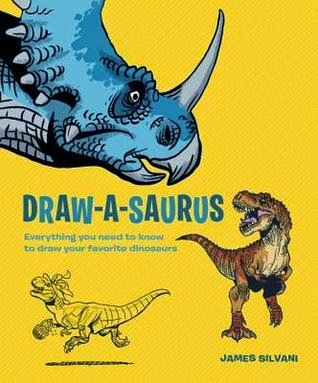 With lessons on old favorites like T-rex and stegosaurus, as well as lesser-known (but still awesome) creatures like the massive argentinosaurus, Draw-a-Saurus has everything the dinosaur fan could ever ask for (outside of their very own pet dino!). My thoughts: Oh.my.heavens. this is quite a book. I was beyond excited to get this book for later use with my Bug, but until I received it, I never imagined how in-depth this book would be. I would highly recommend this for older children, rather than younger. Depending on their skill and attention level, my estimate is that for most kids, this would be appropriate for 8 years and up. If your children is into art, I would suggest starting them off at a young age with a simple drawing book to get them acclimated with basic art skills. That would make following this book easier, though, you can just start art at age 8 (but I think that would be a grave disservice to your kids to wait that long to introduce them to art). Dinosaurs are generally thought of to be a "boy" thing, and I also find that to be a disservice to all of humankind. I think dinos are pretty stinking cool, and the dinosaur-themed books out today for kids are awesome. If you're home-schooling or planning some lessons at home for your traditionally schooled child, you could spend an entire week or more on just dinosaur-themed activities and lessons; this book would be a fantastic addition to your lesson plan. Not only does it incorporate art, but it also incorporates reading, handwriting and spelling. No doubt about it - I will be hanging onto this book until Bug is a bit older, and we will definitely be doing a lesson plan around dinosaurs. In the meantime, I may try my hand at drawing these awesome dinos!